... lots and lots of them! In fact I've lost count have many I've made over the past few weeks, but the end results have made all the hard work worth while. 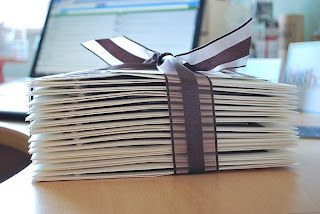 The invites are done and are bundled up just waiting to be hand delivered to the bride-to-be ... I can't wait to see her face tomorrow! Hope everyone has a great weekend and if you're reading this post in the USA, then I hope you have a wonderful Labor Day weekend and get to make the most of any late summer sunshine! Congratulations on this work Sue, I am sure she will be very happy to see this. well done Sue, you can be proud ! Well done Sue! I bet they are amazing! And I am sure she'll be thrilled! Well done Sue! It's all the little touches that make it amazing!